Good Boy Pawsley & Co Bite Size Bites (Beef) are the delicious beef flavoured treats dogs love. These tasty, bite sized treats are perfect for rewarding good behaviour or just to treat your loveable pooch. 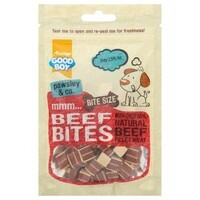 They are made with over 60% real beef so you can treat your dog to something they'll love, which is also good for them!